Keep your car, community, and environment, neat and clean, without sacrificing style! The “Keep It Clean” CarBáge is the ‘must have’ trash bag accessory for keeping your car neat and tidy! No one likes litter! It’s damaging to your community, and even unsafe. With over 250 million cars on the road in the USA, littering can do serious damage to communities, and causes health and hazard risks to everyone- including other drivers. The #1 reason that people give for littering… is the lack of a nearby trash can! And quite a lot of litter comes from people throwing things out their car window because they have no trash can inside the car! While some people might simply keep a plastic shopping bag in the car to throw trash in… this is less than an ideal solution. There’s no ‘true’ spot to ‘hang’ the bag from, and hanging it by the handles, around the shifter, is dangerous for driving. Plus, they’re not very aesthetic, and can be easily confused with a bag of groceries, or even clothes. No one wants to carry that bag in and empty it onto their bed, or kitchen counter! There are other ‘car trash cans’ on the market too… but again, they’re just not very aesthetically pleasing! That’s why we created the “Keep It Clean” CarBáge! The “Keep It Clean” CarBáge is the only car trash bin designed with keeping ‘style’ in sync with functionality! Stylish design, convenient opening, strong strap, secure hanging, closable top lid, adequate space and sleek profile make this trash bag the ideal choice for every vehicle. 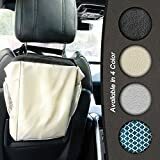 Regardless of the vehicle you own, you will love this waterproof, durable and stylish litter bag to keep your car fresh. 100% SATISFACTION GUARANTEED. CONVENIENCE, SAFETY, STYLE – Super high strength & Leak Proof fabric, Easy to rinse out. CONVENIENTLY straps onto front or back of seats, elastic strap/hook keeps bag from moving. VELCRO LINED OPENING allows bag to stay closed as needed. EASILY ACCESSIBLE by driver and passengers when placed on back of passenger seat. LARGE 2 GALLON CAPACITY! Fits weeks worth of gum/food wrappers, coffee cups, tissues, receipts, gum, cigarette butts & more!